Nothing beats a charcoal grill for searing a steak. That’s because charcoal reaches higher temperatures than gas. That makes this type of grill excellent for cooking cuts of beef and lamb where you want the outside crisp and the inside pink. Many footballs fans love charcoal grills for tailgating. Others prefer them for camping or RVs. Therefore we reviewed the best portable charcoal grills that you can bring to the next event. Weber makes some of the best grills around. Their Go-Anywhere is a top seller because it’s well-designed, compact, and portable. It only weighs 14 pounds. But it has 160 square inches of grilling surface. That’s plenty for six hamburgers or two medium steaks at a time. 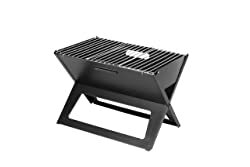 This is a durable charcoal grill made to last for a lot of cookouts. Its steel body has a rust-resistant porcelain enamel coating. Then, both the cooking grate and the pivoting legs are made of nickel-plated steel. The handle of the lid stays cool while you’re cooking. And there are adjustable dampers to control air flow. The Char-Griller resembles a tabletop smoker with its barrel-shaped format. In fact, you can do Texas-style smoking with it as well as grilling meats and vegetables. The thick steel construction and cast iron grates bring it up to almost 40 pounds. But it has handy features like adjustable dampers, a stay-cool handle, and a ash pan that’s easy to dump. Plus, it offers 250 square inches of grilling space. Lodge’s Sportsman’s grill looks like an antique stove with its sturdy cast-iron body. It’s a hibachi grill with no lid. But it has two cooking heights and 155 square inches of cooking space. There is a draft door to regulate the heat and another door to access coals. Moreover, the grate is pre-seasoned and ready to use out of the box. Since the Lodge is so heavy, it might be best for RVs. It’s small enough to store easily but too weighty for backpacking. The Son of Hibachi charcoal grill from Mr. Flame has a throwback to the 80s design. Or rather, it is actually a vintage grill from the 1980s. But it’s also possible to purchase the 21st-century model instead. What’s the advantage of owning a classic grill like this one? First, it’s hot and ready to cook in ten minutes. Also, it converts into a self-cleaning oven or a self-extinguishing barbecue. It also preserves unused charcoal for use at a later time. The grill provides 170 square inches for cooking. Plus, the cast iron grates and carbon steel body are made to last for years of service. The Hibachi style of charcoal grill is a perennial favorite. But Marsh Allen tweaked the original form factor to help you grill more effectively. They curved the edges of the grids to keep hot dogs from rolling away. Additionally, there are three cooking heights and adjustable air vents to help you manage the heat. The grill weighs just 18 pounds and offers 157 square inches for cooking. Marsh Allen also makes this charcoal grill with folding legs. It stands about two feet high. There are three cooking heights and 210 square inches of room for grilling. Moreover, it weighs less than 5 pounds. 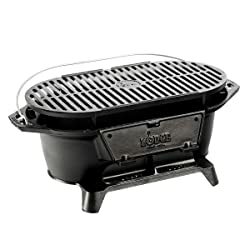 Weber’s Smokey Joe is round, not rectangular like their Go-Anywhere grill. It’s durable enough to come with a 10-year warranty. And it has a 14.5-inch cooking grate with room for three steaks at once. The ten-pound total weight includes the lid with a stay-cool handle. Plus, the metal bowl and lid have a rust-resistant enameled coating. The Jumbo Joe features room for four steaks at a time on its 18.35-inch diameter cooking grill. Like its smaller brother, the Smokey Joe, the Jumbo comes with a durable body that resists rust. Also, the lid has a heat-shielded handle and a lock to keep it closed for transport. While this charcoal grill isn’t as compact as some, it comes with wheels to simplify transporting it. There is an ash catcher directly below the bowl as well as a shelf to hold items. Then, the 18-inch diameter grate cooks four steaks at once, so no one has to wait for their dinner. And the grill comes with a 100% satisfaction guarantee. The Weber Original Kettle may be the inspiration behind the design of the Beau Jardin Grill above. But the Weber model comes with a 10-year warranty. It has 240 square inches of space for cooking on its 18.5-inch diameter grate. Moreover, like other Weber grills, it’s made to last. The bowl and lid are enamel-coated to resist rust. Additionally, the handle is shielded to stay cool while you cook. When it’s time to clean up, just dump the ash catcher and wheel away the grill. Canway’s Camping Stove isn’t precisely a charcoal grill. It also burns wood. It’s ultra-portable because it folds compactly and weighs less than 6 pounds. The aluminum alloy body resists rust and damage. Moreover, the ventilated design encourages rapid startup and even cooking. Additionally, it comes with a 2-year warranty. Pinty’s Portable Grill weighs less than 10 pounds and its legs fold up to save space. It has 250 square inches of cook space plus seven air vents to keep coals hot. But the silicone handles stay cool to the touch when you need to lift the lid. The Notebook grill from Fire Sense stands 13 inches tall, then folds down to a 1-inch height. It offers 228 square inches of grilling space. And the charcoal rack and grate fold inside the body for quick cleanup. Overall, it weighs less than 8 pounds. Now that you’ve chosen the perfect portable grill for the next tailgate party or campout, let’s go over how to use it. Here are some tips for getting the most out of cooking with charcoal. If you oil the grill grates and pre-heat them, your food won’t glom onto them and get stuck there. This is different from seasoning a grill. All you need to do is brush or rub cooking oil onto the grates, then wait a few minutes as the grill heats. There are two methods for lighting charcoal. The first one is easier, but it may cause your food to have an oily taste. It involves using Matchlight charcoal that’s impregnated with fuel or else squirting lighter fluid onto regular charcoal. Once you touch the briquets with a match, just wait until they turn gray and ashy. The second method is to use a chimney made for lighting charcoal. Once you fill it with briquets, you’ll stuff newspaper in the bottom. Then light the paper and wait for the flames to work on the charcoal. Once the briquets are gray, you can move them to grill. While some folks are masters of cooking on a grill, most of us just want our food to turn out safe to eat and not too burned. The trick to managing heat on a charcoal grill is to increase or decrease the air flow. If you want to sear a steak, you’ll need to open the vents wide to make the charcoal burn hot. You can also add more coals on top of the lit ones to raise the temperature. You’ll just have to wait until the news ones turn gray before they are hot enough. Otherwise, to keep from burning your green peppers and onions, close the dampers part way to slow down the air flow. If you have a lid and it’s closed, don’t shut the vents all the way or the fire will extinguish. Besides the visual cue from the color of the briquets, you can check the temperature with a thermometer. If you don’t have a thermometer, try this hack. If you can hold your hand five inches above the grate for two to four seconds, the charcoal is ready to grill meat. It’s about 450 to 550 F. Otherwise if it’s too hot to keep your hand there for two seconds, it’s too soon to cook. If you can maintain your hand in position for five to six seconds, the temperature is probably around 350 to 450 degrees F. But if you’re just enjoying the warmth for up to ten seconds, you’re working with 250 to 350 F.
The best way to keep your food from overcooking is to create a two-zone fire. We know this can be challenging on a small portable grill, especially if everyone wants their food right now. But if you’re grilling chicken, seafood, or pork chops, it’s useful. Simply keep the hot coals on one side with the other side of the grill empty. You’ll have a space to cook slowly over indirect heat. And you’ll be able to manage flare-ups when the grease from the food causes a mini-inferno to appear. It’s straightforward to give your meat that delicious smoked flavor if you add certain types of wood soaked in water to the hot briquets. The smoke that arises will season your meal as it cooks. For example, hickory is a tasty choice, as is maple. Close the grill lid and partly close the dampers. Then let the meat cook at 225 to 250 F for as long as it takes. Check smoker recipes for the most flavorsome ideas and ideal cooking times. The next time you go camping or tailgating, you’ll be ready with your new portable charcoal grill. Whether you want one that folds, a Hibachi, or a kettle with wheels, there’s something for every preference.